Rounded Rectangle Tool is just below the Type tool and beside the path selection tool.This tool is a shape tool.With the help of Rounded Rectangle Tool, we can draw rectangular with smooth rounded edges shape of any size.We can also draw shape of a square with rounded edges with the help of this tool. 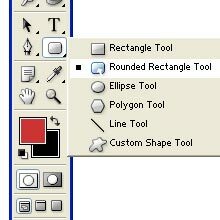 This is the Rounded Rectangle Tool.Go on to that tool and just click on it to select it. 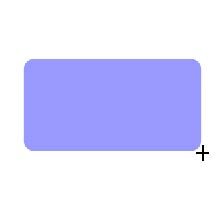 Select the Rounded Rectangle Tool and position the pointer inside the work area and just click and drag.Now we can draw shape of a rounded rectangle of any size. 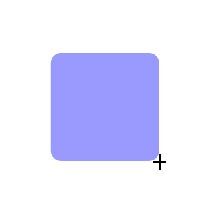 If we want to draw shape of a square with rounded edges, then just click and hold the shift key, and now click and drag the tool.Now we can see the shape of a perfect square with rounded edges.